The rotator cuff is a group of four muscles working together as a unit that are positioned around the shoulder joint. The muscles are named supraspinatus, infraspinatus, subscapularis, teres minor. 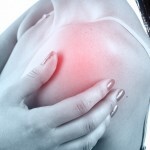 Your shoulder joint is a relatively unstable ball and socket joint. They help to stabilise the shoulder joint through movement of the shoulder. The most common rotator cuff injury is that of the supraspinatus tendon. The tendon lies below the subacromial space and it can become easily damaged or impinged during movement of the shoulder. When there is an injury to one of the rotator cuff muscles the other rotator muscles are prone to injury soon after as they work as a unit. Rotator cuff injuries are commonly seen in sports where there is repetitive over arm activities. The supraspinatus tendon under the subacromial space becomes irritated and inflamed. In non-athletes, there may be a history of recent heavy lifting or activities involving repetitive movements of the shoulder.Sometimes the rotator cuff tendons can become calcified. This is when calcium is deposited in the tendons, due to long-standing inflammation. This is called calcific tendonitis. Early physiotherapy intervention is important to prevent this occurrence and to help restore normal movement and strength of the shoulder.